The first thing you read about Colchester is that it is the oldest town in Great Britain. With remnants of a Roman period wall that used to surround the area, today you can’t help but notice that it’s one of the busiest places in Essex. Traveling in and around the Towne Center used to be, and at times can still be a bit on the congested side, but the number of amenities in and about the town certainly make it worth it. For those who need to commute there are two stations that handle both the inner City and outer areas in London. The East side of Colchester is where you will find the University of Essex, so for Colchester rental apartments there are a number of options for students. But the university is just one of the many schools and educational treasures to be found in the Colchester area. A number of private award winning schools are available to families with children young, or in their teens. These features draw families and professionals more towards the Western side of Colchester. Lexden may be the buzz word you hear when referring to the more family oriented pockets of Colchester. Undoubtedly, you will enjoy selecting from a wide variety of architectural styles places from new builds to Georgian, Edwardian, and even a touch of Regency. For the most period, Colchester rentals look near the city Center around the Dutch Quarter or on or around East Street. There’s no reason to sit home on weekends or even weekday nights with so many culturally diverse things to see and do in Colchester. Certainly, there is a multitude of museums, with the Natural History Museum and Castle Museum competing for the top spots, but three more exist in the town that is also great for a rainy day. If music is your passion you can hear concerts from just about any kind of genre at The Arts Center. Like museum selections, you have a number of other theater venues to choose from in the Lakeside, Mercury & Headgate, or the modern day movie plex at the Odeon. If you’re entertaining guests from out of town than the Colchester Zoo is a must see. Want to know more about Colchester Rentals? 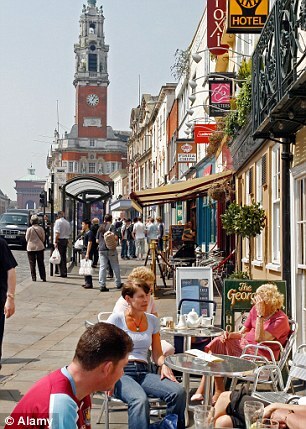 When it comes to dining in Colchester, a walk down high street will bring you options from cuisines around the world. Beginning with a traditional European menu one should try Bill’s Colchester Restaurant for contemporary all day dining. Should you take in a meal at Bill’s you will definitely want to head around the corner for an after dinner drink in the old London Library building that now houses Memoirs Restaurant and Cocktail Bar. It’s worth seeing the architecture and they have a large selection of cordials for an after dinner treat. Just around the corner is Nando’s, a great spicy Afro-Portuguese chain that has a location at High Street and Head Street. Albatta’s, is a spot for an after meal coffee if a cocktail is not to your liking. It is Italian at ASK Italian, which is a modern chain here in London that serves long pizzas. And just next door to that is The Green Room, a casual hotel bistro that sticks to the traditional British fare. Just south is The Playhouse, which is another converted building. The high roofed pub is located in this old theatre and is a treat to appreciate from within. Or across the street, you can grab continental dishes or a pint at Victus Bistros. Or if you need a quick bite or a take away try The Warehouse Brasserie (also a great building that is a loft style), Nindy’s on Dugard Ave, The Frying Castle, or Dr. Chippy’s if you want to indulge in the traditional Fish & Chips. We recommend you skip the take away if it’s Chinese you’re after and enjoy the Embassy Oriental Buffet on Balkerne Hill. Another restaurant you will surely want to sit down and enjoy is The River Lodge on Middleborough, which opens early at 11:00 a.m. for lunch. Also, open at 11:00 a.m is The Three Wise Monkey’s pub for a quick bite. Or if you are busy shopping at Clerkenwell’s they have a café that serves lunch as well, and is on Farringdon Road. There are two additional restaurants in Colchester that are both worth a visit. The Toby Carvery Stanway is a traditional British family style restaurant that has table side carving and is great when you’re really hungry. For a bit lighter fare, but well worth the visit check out the Hall Farm, it’s a café styled place on Stratford Road that uses local produce and boasts farm to table offerings that are simple but done very well. For pubs in the area, you have a number of choices in Colchester. To the West end of town, you’ll find The Slug and Lettuce, which is a no-frills choice with a traditional British menu on High Street, or up one block to The Foresters Arms. Heading more towards downtown you will find Molloy’s on North Hill, The Bricklayers, a super great pub for simple food and a wide selection of ales. The Kings Arms on Crouch Street is another good choice or The Purple Dog on Eld Lane of The Wooden Fender on Colchester Road. Or if you are straight downtown you will find The Harvester Stanway, and The Swan Inn, both on London Road. Colchester being the oldest area in London has been largely developed, so while there is green space laid out within the city, there really is only one choice for a park, Castle Park. It is a large park and hosts a Castle Museum which is worth a look. There’s also a café in the center of the park to grab a coffee and tea to go, both stay open until 5:00 p.m. However, the park itself is open until 9:00 p.m. It’s not unusual to see varied events hosted in the park, and it’s certainly easy to find right off High Street. Within the park is Highwoods Country Park. There are two rail stations in Colchester to choose from, Colchester Town Station and Colchester North. For travel in the local area you will want Colchester Town, for main line connections you will want to head to Colchester North Station. The stations are maybe a quarter hour walk apart from each other. There is also the bus station which you will find at the Center of town on Queen Street.